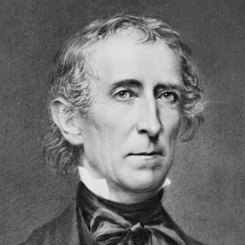 Image courtesy of Library of Congress After winning a special election to the 14th Congress (1815–1817), Representative John Tyler of Virginia served for three terms before retiring to serve in state politics. Tyler was later elected a U.S. Senator and eventually Vice President—succeeding to the presidency upon the death of William Henry Harrison. On this date, in the waning hours of the 28th Congress (1843–1845), the House joined the Senate to pass Congress’s first presidential veto override (over lame-duck President John Tyler’s veto of an appropriation bill). Introduced by Senator Jabez Huntington of Connecticut in January 1845, the original bill prohibited the President from authorizing the building of Revenue Marine Service (Coast Guard) ships without approved appropriations from Congress. President Tyler vetoed the bill to protect existing contracts and to retain presidential prerogative. Huntington responded that “the objections made by the President relied entirely upon a mere philological criticism.” On the final day of the session, the Senate overturned Tyler’s veto with only one dissenting vote and sent it to the House for immediate consideration. The House debated late into that evening. As it proceeded to vote on the bill, Thomas Bayly of Virginia noted that “the clock, the hand of which was just at 12 [midnight] . . . had been stopped for five minutes, and that by the constitution the House was adjourned.” Because Congresses prior to the 20th Amendment expired on March 3, Bayly argued legislative business must cease after the stroke of midnight. The Speaker, however, refused to “entertain any motion while the house was dividing,” and ordered the Clerk to proceed with the roll call vote. The House voted 126–31 in favor of an override, nullifying Tyler’s veto. Congress would not override another presidential veto for more than a decade when, during the administration of Franklin Pierce, it overrode five of his nine vetoes. To date, U.S. Presidents have vetoed more than 2,500 bills—with Congress overriding the President less than five percent of the time.